Coin Pop is a paid mobile application whose principle is exactly the same as fitplay and AppLike and which is also managed by AppLike GmbH. Indeed, although the interface is slightly different, the principle remains the same : offer you mobile games and pay you to play to them. Sometimes, Coin Pop will offer you new mobile games to test. You just have to install them and start playing these games to accumulate coins exchangeable for Paypal payments or Zalando gift cards. 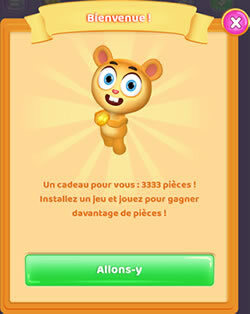 Note that your will already get 3333 pieces, as well as 25% of my earnings by installing this mobile application if you go through the link of this review. Payment via Paypal from 0.4 € and possibility of obtaining Zalando gift cards from 5 €. As a sponsor, you receive 250 points when your referral has downloaded the application via your link + 25% of the coins he wins. As a referral, you can also receive 25% of your sponsor's earnings by downloading Coin Pop via his link. To do this, click on the "Access the site" button at the top of this page. Mobile application very similar to fitplay and AppLike that allows you to make money by playing on your smartphone or your tablet.